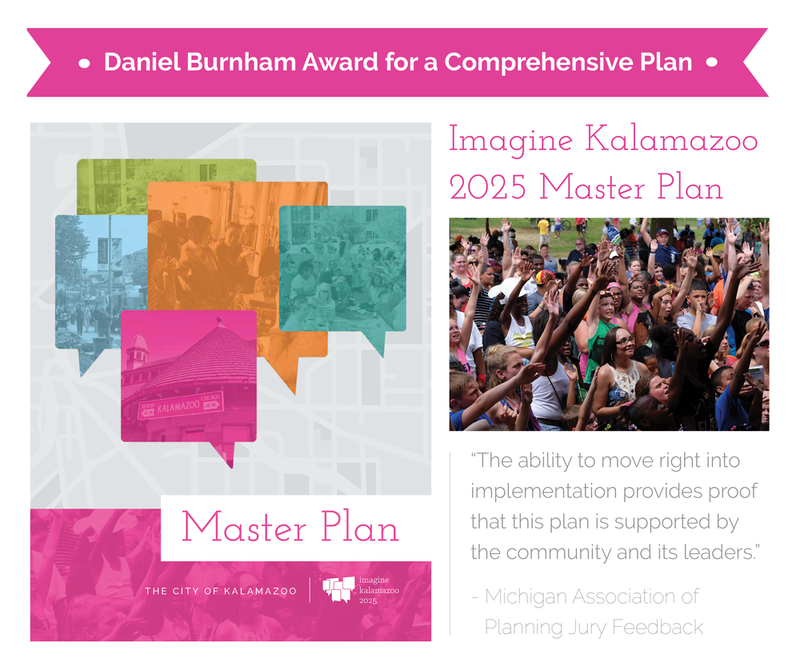 The Imagine Kalamazoo 2025 Master Plan will be awarded the Daniel Burnham Award for a Comprehensive Plan by the Michigan Association of Planning (MAP/APA Michigan) at its annual conference, Planning Michigan, on September 20 at the Amway Grand Hotel in Grand Rapids, Michigan. The Daniel Burnham Award for a Comprehensive Plan is presented annually to plans that advance the art and science of planning. The award is named for Daniel Burnham, one of the nation’s most renowned urban planners. In addition to the Daniel Burnham Award, the Imagine Kalamazoo planning effort and project leadership will be recognized with two additional awards. A partnership with students from Michigan State University’s Planning Practicum Class will be recognized with the Outstanding Undergraduate Student Project Award. Starting in January 2018, these students have helped to craft a neighborhood plan for Kalamazoo’s Vine Neighborhood by providing high quality analysis of neighborhood issues and creating comprehensive goals for the neighborhood. Kalamazoo City Planner Christina Anderson will be recognized with the Leadership Award for a Professional Planner. Christina served as a consultant to the Imagine Kalamazoo 2025 planning effort before being named City Planner in 2017. Over a 16 month period from 2015-2017, City staff led a collaborative process to identify Kalamazoo’s community priorities and create a new Strategic Vision and Master Plan. Throughout the process there were more than 4,000 points of contact total including “Meeting on the Go” participants, survey respondents, online engagements, living wall and graffiti wall comments, and community meeting participants. The resulting Imagine Kalamazoo 2025 Strategic Vision and Master Plan were approved by the City Commission in 2017, and will guide all future plans and decisions for the City for the next 10 years. The IK2025 Master Plan imagines a future for Kalamazoo where diversity is embraced, everyone has the opportunity to prosper, residents can easily and safely move through the City, and the quality of life is enhanced for all.